"What makes me happy is just the silence, peacefulness and connecting with the earth." FARM TYPE / CROPS: Wide diversity of vegetables, pasture raised chickens. Driven by his love of flavor and healthy foods, Steven Tomlinson has created a haven in which a multitude of each can be found. 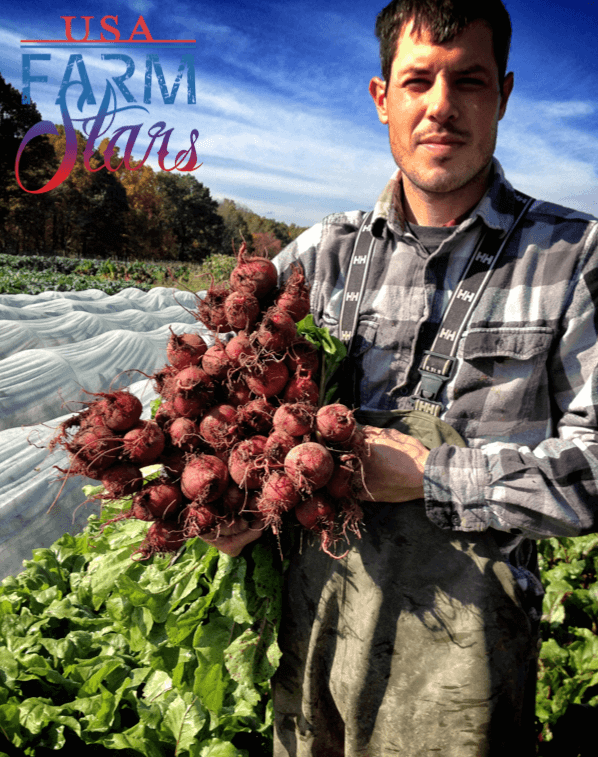 By working with the restaurant owned by the farm, he works to provide his community with locally grown ingredients and healthy dishes. What's your relationship status? Do you have children? I’m married and I have a baby boy. The furthest I’ve traveled is to Buenos Aires, Argentina and I’d really like to go to the south of France for surf and food. I really do not strive to make money, I think we need it but of course it’s low on the priority list for me. How did you get into bee keeping/farming? I started as an artist and designer, I wanted to make things. I was designing furniture and working in wood shops. I then worked towards more eco-friendly materials and when that happened, I started thinking about what I wanted to do and create. Then I decided the best thing I could do would be create vegetables. The economy crash allowed me to start what I wanted to do. I pursued ecology and found out most ecology students are famers, so I just left school and became a farmer. I was looking forward to living a modest lifestyle and providing healthy foods for my community and wanted to have an impact with what I was doing. I didn’t want to end up designing toothbrushes that would get thrown away; I decided I would rather design vegetables. The hardest part was making all the sacrifices of creature comforts to learn how to farm. It was the most difficult but most enlightening part, you learn to live with a lot less, but become more frugal. What surprised me was how intellectually stimulating and complex it is. It’s not simple at all. Broken down in elements it can be, but you must have a diversity of skills and experience to run a farm to break even, or make a small profit. Usually my day starts at 7:30 when it’s farming season. I start with harvesting lettuce and leafy greens, mid-morning I harvest root crops like radishes, carrots, squash etc. In the afternoon, I spend a lot of time washing our vegetables, then pack up CSA shares, drop them off to the restaurant. I also include the restaurant order. By the end of the day I’m collecting eggs and closing up chickens. What makes me happy is just the silence, peacefulness and connecting with the earth. When I’m weeding and harvesting, it clears my mind once I get into a rhythm. When you come to rhythm with yourself and the season it becomes natural and calming. When things don’t go as planned. When you give a task and it doesn’t get done properly. When water freezes in the wintertime and I have to carry five-pound buckets of water to my chickens twice a day. The lesson that stuck out for me is, you can’t cut corners on the quality of the materials you use on the farm, like soil. The first year I bought nice soil and the plants were beautiful, the next year I went cheaper and bought from another soil man and plants were horrible. It’s all about buying good quality products. The biggest misconception would be people think that, at least for vegetable farmers, that we’re perfect individuals, that we drink water out of cow bladders, we recycle everything and live the holistic lifestyle. People think that we give everything for free back to our community or anyone can come visit our farm whenever. It’s nice to be held at that standard, but we’re just normal people like everyone else. People just think we’re hippies. Stay out of debt. Find someone who can help you along the way. Spend five years working on farms before you purchase your own. Experience is everything. It's best to learn mistakes with other people that can share their experience rather then going on your own, without any experience. Connect with local farmers and share knowledge and resources. It’s a lot of hard work and the price might be little higher, but you get what you pay for. So if you want to support your farmers, go to your local farmers’ market and pay the price, which is still a bargain. Longevity of farmers, farmers continuing on, things such as land development. Turning land into housing developments would be a concern too, and not having the support of more local food hubs. Beyond farms, we need more support of distribution and outlets for farmers. I think I’ll still be farming, maybe doing some consultant work, and possibly have my own farm.